It took me a long time to fall in love with running. I was young when our relationship started. I began running in high school for selfish reasons— to impress colleges and universities with another extracurricular activity on my applications. I never played organized sports as a youngster, and working in a team environment was something unfamiliar to me. My freshman year of high school, I played volleyball, which I enjoyed, and softball, which I was terrible at. The following year, I joined the track and field team. I liked the idea that I could participate in individual events or relay teams, and that I could score points and contribute to my team by placing in an event. As a bonus, many girls on the team were already my friends, so I knew I would have fun. And so began my running journey. Although I was not athletic and never stood out during those early years, I did earn my varsity letter and a couple of medals in cross country and track. Sadly, running and I broke up when I went away to Michigan State University. Through the years, I maintained my fitness through walking, strength training, and yoga. By chance, I was vacationing in Hawaii during the Kona Ironman World Championship in 2006 and watched the marathon portion of the event. I was so impressed by the competitors’ athleticism and thought someday I would like to do this. Until I had two children, I never made a full commitment to exercise. It was a way for me to get back in shape, and I found psychological benefits in it as well. In 2011, my life was interrupted by personal hurt and disappointment. I began losing weight unintentionally due to a stressful and painful divorce. I needed therapy to work through my problems. Three friends (Eva, Karen, and Kelly) from high school who helped me through my divorce invited me to the church they attended, and my life began to turn around. I decided to take more control of my health. I bought a bike and started to ride. I regained my strength by going back to the gym, and my weight began to normalize. I also found a yoga instructor I really liked. However, my cardio was nowhere near what I wanted it to be. On a random cold winter morning, I challenged myself and ran 1 ½ miles around my neighborhood. I laugh when I look back because I wore an old pair of cross trainers and cotton! The following day, my church announced that it was forming a running group to raise awareness and funds for clean drinking water in Africa. I will never forget how inspired I felt hearing Ben Reyff’s “why I run” story. It was life changing for me. What were the chances that I ran for the first time in 20 years just the day before? I felt like God was speaking to me to serve a cause greater than myself. Hope Water Project was formed in 2013. I immediately signed up for the Detroit Free Press full marathon and put together my fundraising page. I knew I needed to talk to runners who had experience training for long-distance races. My brother Alex had run several marathons with Team in Training and gave me training advice and tips on fundraising. Erin, one of my best friends from high school who ran cross country and track with me, had run several long-distance races. She gave me good advice, including what to wear, how to avoid chafing, and that I needed to go to Hanson’s Running Shop to get proper shoes. Two friends from work, Diana and Tahuanty, were both experienced runners and encouraged me. When I was finally able to run more than six miles without stopping, I joined my Hope Water teammates for Saturday group runs at Stoney Creek Metro Park. I made so many friendships at the group runs, but the two I cherish most were with Jim and Megan. I logged some heavy miles with the two of them. They were so accommodating. As a single mom, I needed to run in the early mornings to get the kids to school on time and make it to their Saturday morning soccer games. My mom and brother Richard would come over at 4 a.m. to watch my kids so I could get my run in. I’m not the type of person who likes to ask for help, and it’s hard for me to accept help when it’s offered. Is it weird to think running made me more confident in asking for and accepting help? 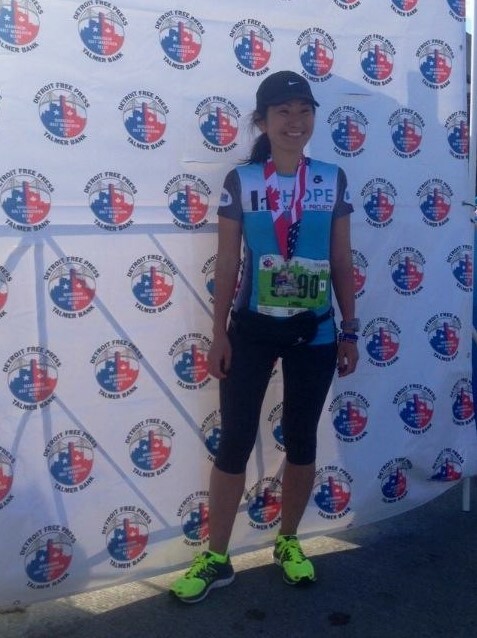 I was so nervous the day of my first marathon. I didn’t know what to expect, and I just wanted to finish. The energy of thousands of runners at the start was intoxicating. “Lose Yourself” by Eminem started playing, and I was pumped. Watching the sunrise over Detroit while running on the Ambassador Bridge into Windsor, Ontario, was breathtaking. The fans awaiting us as we came out of the Detroit Windsor Tunnel were crazy. My pastor was there cheering for our team. I saw Erin at the halfway point and gave her a big kiss on her cheek. I remember running through the 20-mile mark on Belle Isle and starting to cry. It was the longest distance I had ever run. Things began falling apart later, when I had a bad cramp in my right calf. As I was running the last three miles through the riverfront, Erin was there. She ran with me and helped me get to the finish line. The Detroit Marathon was only the start. 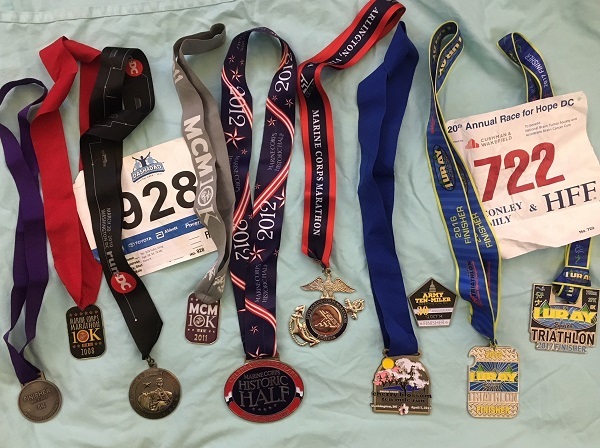 By the end of 2013, I had run eight races (5K, 10k, 10 mile, three half and two full marathons). More important, through the support of so many friends and family, I raised over $2,500 for clean drinking water in Africa. Most impressive was our team of more than 1,400 runners raising more than a million dollars for the Pokot people in Kenya. Please check out the Hope Water Project and Hope Water International websites (here and here) for more details on these wonderful organizations. I love the challenge of training and running races. Achieving personal goals while helping others is a rewarding experience. Forrest Gump famously said, “My mama always said you got to put the past behind you before you can move on. And I think that’s what my running was all about.” Later, he says, “I'm pretty tired. 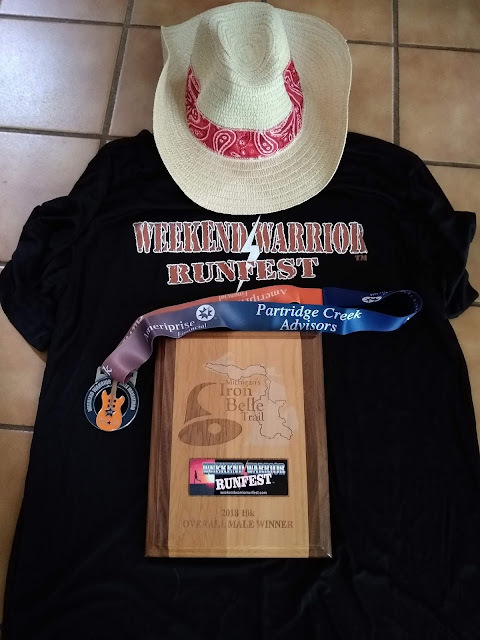 I think I'll go home now.” He concludes, “And just like that, my running days were over.” As for me, I put my past behind me before I started my second relationship with running, and I hope I have many more running days to come.